The Anaheim Ducks continue to deal with a rash of injuries, as top defenseman Hampus Lindholm has now joined the sidelined. CapFriendly reports that Lindholm has been placed on the injured reserve, a change also reflected on the team’s official roster albeit not yet announced by the Ducks. There has been no word yet on the type or extent of the injury that Lindholm has suffered, but Ducks fans will hold out hope that it is relatively minor. The team is already without Cam Fowler, on IR with a facial fracture, and have yet to see Korbinian Holzer this season due to a wrist injury. On top of a depleted back end, the team is also missing quite a few names up front, including core forwards Corey Perry and Patrick Eaves. A Lindholm absence of any length hurts, but Anaheim can ill afford a long-term hiatus. Lindholm, 25, not only leads all Ducks skaters in ice time, but his 25:29 ATOI is seventh-best in the whole league. Lindholm is also tied for third in scoring for Anaheim with ten points, among the top scoring defensemen in the Pacific Division. Without Lindholm and Fowler, the Ducks are sorely lacking their regular leadership and top sources of production on the blue line. Although they have yet to announce this transaction as well, the team’s roster shows that defensemen Jake Dotchin and Josh Mahura have been recalled and both could soon find their way into the starting lineup, with Luke Schenn clearing waivers and destined for the AHL’s San Diego Gulls. Dotchin played in 48 games with the Tampa Bay Lightning last season, but has yet to make his Ducks debut, while first-year pro Mahura would be making his first NHL appearance. The two have performed well for San Diego this season, but face a tall task if asked to help make up for a long-term Lindholm absence in Anaheim. Sunday: Jeremy Rutherford of The Athletic reports that Schenn cleared waivers and will report to the San Diego Gulls of the AHL. Saturday: The Ducks have placed defenseman Luke Schenn on waivers, Sportsnet’s Elliotte Friedman reports (Twitter link). The veteran has had a limited role with Anaheim this season, playing in just eight games while averaging a career-low 11:59 per night of ice time. He’s in his first season with the Ducks after inking a one-year, $800K contract with them this offseason. The timing of this move seems a little curious on the surface with Cam Fowler out indefinitely following surgery to repair a complex facial fracture. At the very least, the team has a pair of veterans with recent NHL experience in the minors that they can call up to take Schenn’s place in Andrej Sustr and Jake Dotchin. Given that Schenn is a right-shot defender (something that is typically in high demand) and has a relatively cheap price tag, it wouldn’t be surprising to see a team in need of some defensive depth place a claim. They’ll have until 11:00 AM CST on Sunday to do so. If Schenn clears and is sent to their AHL affiliate in San Diego, his full cap hit will come off Anaheim’s books. More so than almost any team in the league, the Anaheim Ducks look to have uncertainty at the bottom of their roster. So far the 2018 offseason has been for the most part spent re-signing their own players, inking John Gibson and Adam Henrique to long-term extensions while reaching a two-year bridge deal with Brandon Montour. In free agency, the Ducks failed to secure any of the top names and now find themselves in a position where training camp could have a huge impact on who starts the season in Anaheim. Up front, the Ducks have just ten forwards currently signed to one-way deals, not including Ben Street or Anton Rodin who have limited NHL experience and didn’t play in the league at all last season. Neither veteran minor league player should really be in contention for a roster spot with the Ducks, but that doesn’t mean there won’t be competition. Even once Ondrej Kase and Nick Ritchie are signed and given their spots, the team has a group of other forwards competing for the last few roles. Brian Gibbons and Carter Rowney were both signed early in free agency and given $1MM+ salaries to provide some depth at the bottom of the lineup. Neither player has really proven himself at the NHL level though, with Gibbons playing 59 of his 125 career games last season for the New Jersey Devils and Rowney suiting up just 44 times last season for the Pittsburgh Penguins. The idea of handing either of them a full-time role without competition seems foolish, though since Rowney was brought in on a three-year deal he will obviously have the upper hand. Behind them are several players on two-way or entry-level contracts, like Troy Terry, Kalle Kossila, Kiefer Sherwood and Kevin Roy. The latter three all spent time in the minor leagues with the San Diego Gulls last season, while Terry played just three games for the Ducks after signing out of the University of Denver. Given the uncertainty around Ryan Kesler’s health and the limited upside of both Gibbons and Rowney, you could see Anaheim decide to give a real chance to one of these players in 2018-19. That is, if they can hold off the competition. One of the questions most often asked in our PHR Live Chats is whether or not Sam Steel and Max Jones are ready for the NHL. The pair of first-round picks from 2016 are now both 20 years old and will be beginning their professional careers, but there’s no guarantee that either will see the NHL just yet. Jones in fact was listed pretty far down in Corey Pronman’s recent prospect rankings for The Athletic (subscription required), including him in the “Have A Chance” section. There will be a huge battle between all of the listed forwards (and probably several others) for playing time in Anaheim this season. On defense it’s also not clear who will shake out at the end of camp. The team signed Andrej Sustr and Luke Schenn this summer to improve their depth on the right side, but both likely can’t play with Josh Manson and Montour already locked into positions there. Marcus Pettersson, Jacob Larsson, Josh Mahura, Jaycob Megna, Andy Welinski and Korbinian Holzer are also all still in the organization and could challenge for the 6-7-8 spots, with no clear choice on who would play where. The departure of Kevin Bieksa and Francois Beauchemin certainly opens up some playing time, but the team will likely wait for someone to step up and prove they deserve regular minutes before handing them out. All of this just makes for an interesting next few months for the Ducks, who are trying to get back to Stanley Cup contention with much the same team as the last few seasons. With Ryan Getzlaf and Corey Perry now entering their mid-thirties, more responsibility will have to be heaped upon the next wave of talent if the team is to stay respectable. Battles like the ones that will take place in training camp will determine whether this Ducks team is just a very good one, or a real contender for the Stanley Cup. The Anaheim Ducks have gotten in on some more free agent action, who according to Frank Seravalli of TSN and Craig Custance of The Athletic have signed veteran defenseman Luke Schenn and minor league goaltender Jared Coreau. Schenn’s deal is for one year and $800K, while Coreau agreed to a two-way contract worth $650K at the NHL level. The Arizona Coyotes have agreed to terms with one of their 2019 free agents, but it doesn’t look like that will happen with any of those scheduled to hit the market this summer. Craig Morgan of AZ Sports reports that all four of Brad Richardson, Luke Schenn, Kevin Connauton and Zac Rinaldo are likely to go unsigned before July 1st and become unrestricted free agents. 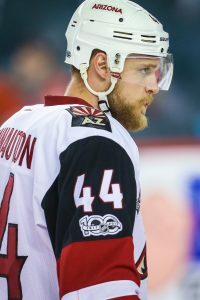 Richardson’s fate was likely sealed when the Coyotes traded for Marcus Kruger recently, while Connauton has been clear that he’s hoping for a bigger role—one that might have to come on another team. It wouldn’t be surprising to see the Coyotes go after some bigger names this offseason in either free agency or trade, hoping to support their young players and get back to the playoffs in 2018-19. That said, all four of the above names could find jobs around the league as they still represent useful depth options. Schenn, a former fifth-overall pick, has already played 708 games in the NHL and won’t turn 29 until after the 2018-19 season starts. Though he never did become the shutdown first-pairing defender that Toronto thought they were picking, he’s not the worst option for a third-pairing right-handed defenseman that play a physical game and help on the penalty kill. Connauton too brings some upside on defense, after recording 21 points in 73 games while seeing the ice just over 15 minutes a night. His 11 goals all came at even-strength, and he could have some even better numbers if given an opportunity. That’s what he’ll look for, but it’s not clear who will be willing to give him a full-time role right away. Free agency is now a little more than a month away from opening up and there are quite a few prominent players set to hit the open market while many teams have key restricted free agents to re-sign. Here is a breakdown of Arizona’s free agent situation. 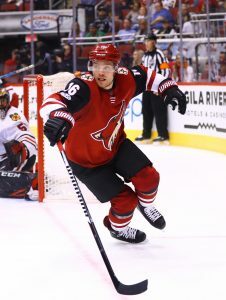 Key Restricted Free Agent: F Max Domi – The 12th-overall pick from 2013 is an enigma for the Coyotes, who have received flashes of dominance and bouts of inconsistency from Domi throughout his young career. Few would argue with 135 points in 232 games for any forward before his age-23 season, but there is clearly more to get out of Domi as he heads out of his entry-level contract. After spending time at center this season his point totals were boosted by a late-season run, but he failed to eclipse the 10-goal mark for the second consecutive year. Perhaps because of that relatively disappointing total, trade rumors have popped up around Domi with the Pittsburgh Penguins showing interest. While nothing is certain for any NHL player, the future for Domi is particularly unclear. Does he sign a long-term deal with the Coyotes this season to be a core piece of their rebuild, anchoring the top-six alongside Clayton Keller and others? Is a short-term bridge deal a better option for a player who has yet to really show his full potential in the NHL? Do the Coyotes use this summer to cash in on their asset before he becomes too expensive, and try to acquire a more veteran presence to help them win in the near future? With GM John Chayka loathe to lose out on young inexpensive assets, trading Domi at this point seems like the opposite of the Coyotes model. Perhaps Arizona will show patience and accept his 6.0% shooting percentage in 2017-18 as more of a bargaining chip than reason to move him. Key Unrestricted Free Agents: D Kevin Connauton – The Coyotes face a much more difficult crop of unrestricted free agents in the summer of 2019, when Oliver Ekman-Larsson, Niklas Hjalmarsson and others are scheduled to hit the free agent market. They also already dealt with Antti Raanta, their biggest question mark from this offseason, when they signed him to a new three-year extension. Still, Connauton has a pretty compelling case for a raise this summer from the $1MM he’s earned the last two years. The 28-year old defenseman finished third on the Coyotes in scoring by defensemen with 21 points, and did so in limited minutes that included almost zero powerplay time. His 11 even-strength goals actually put him fourth on the entire team—not just among defensemen—and he tied for the lead with three game-winners. All that while playing just over 15 minutes a night, and getting relatively even zone starts (if not a little negative). There’s obviously an argument to be made to let Connauton walk, as the team will likely have Jakob Chychrun back and could get contributions from younger players—including perhaps one selected with the fifth-overall pick in the upcoming draft. His agent also recently told Craig Morgan of AZ Sports that like many other players, Connauton wants a bigger role. If that’s not possible in Arizona, perhaps he’ll find himself in a new sweater come October. F Brad Richardson – Richardson’s fate may have been sealed when the Coyotes traded for Marcus Kruger in early May, as the former Carolina Hurricanes forward is expected to take over as the shutdown center for Arizona next season. The 33-year old Richardson then would be expendable, even if he has proven to be a big part of the leadership group for the club. His 15 points in 76 games this season were far from a career-high, but still represented a solid campaign for a player tasked with winning faceoffs and getting the puck out of his own end. Richardson had a whopping 66% defensive zone-start percentage, easily the highest on the Coyotes last season. Centers are difficult to find on the open market, but there may be no room for Richardson any longer on a Coyotes team that is looking to contend for the playoffs in 2018-19. If Dylan Strome is truly ready to step into a full-time role in the NHL, it gives the team four—Derek Stepan, Christian Dvorak, Strome and Kruger—capable options down the middle with even more experience in other players on the roster. His market may lie elsewhere around the league as he’s proven himself a capable NHL option over the last decade. With the KHL season over, there continue to be numerous rumors connecting foreign free agents, young and old, with interested NHL teams. Trusted European hockey insider Igor Eronko of NHL.com says that Lokomotiv Yaroslavl defenseman Ilya Lyubushkin is next up. Eronko relays the message that Lyubushkin is set to sign with the Arizona Coyotes. While no terms of the deal have leaked yet, the 24-year-old Lyubushkin seems to be more of gamble on upside for the Coyotes rather than a player expected to start immediately without issue. The contract will most likely be for relatively little money and may even be of a two-way nature. In 2017-18, Lyubushkin tallied just nine points in 50 games, which was fifth among Lokomotiv defenseman. The stay-at-home defender was more effective in his own zone, posting a +14 rating, but even this was fourth on the team. Lyubushkin’s only noticeable lead on Yarolslavl was in penalty minutes, where he was tops by a wide margin due to his propensity for the physical side of the game. What the Coyotes likely see in Lyubushkin is a strong, young blue liner who already has extensive pro experience, with five years with Lokomotiv under his belt. A right-shot defenseman under 25 with that much experience doesn’t hit free agency very often and Arizona likely hopes that his more conservative games translates well to the NHL. They could use him sooner rather than later, as Luke Schenn’s free agency leaves only Jason Demers as a right shot on the Arizona back end. Even in the AHL, there are no better righty options to step in than Lyubushkin, as only college free agent Jordan Gross – a similar style player to Lyubushkin – looks ready to play at the pro level. Of course, this situation could all change this off-season in free agency or if the ’Yotes land elite defenseman Adam Boqvist in the draft (though they would of course prefer lefty Rasmus Dahlin), but for now Lyubushkin looks to be a sleeper pick to fill a regular role with Arizona in the next year or so. With the team comfortable at both goaltending and defense, the Arizona Coyotes are expected to be add to their forward lines this offseason. Don’t be surprised if Arizona looks into the free agent market this summer and attempts to grab itself a top-six forward, according to AZCentral’s Richard Morin. A team with ample cap space, Arizona has spent the last few years building through the draft and then this past season made multiple trades to upgrade its roster, acquiring the likes of Derek Stepan, Antti Raanta, Niklas Hjalmarsson and Richard Panik. The scribe writes the franchise, especially after an impressive second-half run, might look to dip its feet into the free agency market. While acquiring center John Tavares is not a likely scenario, the team might be able to snag an elite winger such as James van Riemsdyk, Patrick Maroon or Rick Nash.Â The team will have a couple of their own free agents they must sign, including veteran Brad Richardson, Zac Rinaldo, Kevin Connauton and Luke Schenn (as well as try to extend defenseman Oliver Ekman-Larsson), but the team should have the assets to upgrade their offense. Morin does also admit that general manager John Chayka might also go back to the trade route as well, but at the same time, the team believes they will see an uptick in production from rookie Clayton Keller and now believe that prospect Dylan Strome is ready to handle full-time duties in the NHL. While the Los Angeles Kings are expecting back defenseman Jake Muzzin from injury, the Vegas Golden Knights might get back an injured player of their own as head coach Gerard Gallant said winger David Perron is a game-time decision, according to the Las Vegas Review-Journal’s David Schoen. Perron, who has been out since Mar. 26 with an undisclosed injury is expected to return and start on the team’s third line if he returns to the game. “There’s a chance he might play tonight,” Gallant said. Adam Vingan of the Tennessean writes the Nashville Predators might be getting Calle Jarnkrok back from injury soon. The forward hasn’t played since Mar. 13 due to an upper-body injury. He scored 16 goals this year as a bottom-line forward. Orange Country Register’s Eric Stephens reports that Anaheim Ducks defenseman Cam Fowler is not expected to go on the team’s road trip to San Jose. Fowler has been out with a shoulder injury since early April.